A superhero is a type of heroic stock character, usually possessing supernatural or superhuman powers, who is dedicated to fighting the evil of their universe, protecting the public, and usually battling supervillains. A female superhero is sometimes called a superheroine, although the word superhero is also commonly used for females. Superhero fiction is the genre of fiction that is centered on such characters, especially in American comic book and films since the 1930s. Insomniac Games, Inc. is an American video game developer based in Burbank, California. It was founded in 1994 by Ted Price as Xtreme Software, and was renamed Insomniac Games a year later. The company is most known for developing several early PlayStation mascots, Spyro the Dragon, Ratchet, and Clank, as well as the Resistance franchise, 2014's Sunset Overdrive and 2018's Spider-Man. Iron Man is a fictional superhero appearing in American comic books published by Marvel Comics. The character was co-created by writer and editor Stan Lee, developed by scripter Larry Lieber, and designed by artists Don Heck and Jack Kirby. The character made his first appearance in Tales of Suspense #39, and received his own title in Iron Man #1. Thor is a fictional superhero appearing in American comic books published by Marvel Comics. The character, which is based on the Norse deity of the same name, is the Asgardian god of thunder who possesses the enchanted hammer, Mjolnir, which grants him the ability to fly and manipulate weather amongst his other superhuman attributes. Christos N. Gage is an American screenwriter and comic book writer. He is known for his work on the TV series Daredevil, Hawaii Five-0, Law & Order: Special Victims Unit, Numbers and the films The Breed and Teenage Caveman. In the comics industry, he has done considerable work on the titles Angel & Faith, Avengers Academy, The Amazing Spider-Man and The Superior Spider-Man, Spider-Geddon and has written tie-in books for the "Civil War" and "World War Hulk" storylines. Dan Slott is an American comic book writer, who is the current writer on Marvel Comics' Tony Stark: Iron Man and Fantastic Four. He is best known for his long run on The Amazing Spider-Man, as well as Arkham Asylum: Living Hell, She-Hulk, Silver Surfer, The Superior Spider-Man, and Ren & Stimpy. Yuri Lowenthal is an American actor, producer, and screenwriter known chiefly for his voice-over work in anime, cartoons and video games. Some of his prominent roles in anime and cartoons include Sasuke Uchiha in Naruto, teenage Ben Tennyson in Ben 10, Jinnosuke in Afro Samurai, Simon in Gurren Lagann, and Suzaku Kururugi in Code Geass. In video games, he voices The Prince in Ubisoft's Prince of Persia, Alucard in Castlevania, Hayate/Ein in Dead or Alive, Matt Miller in Saints Row, the Protagonist in Persona 3, Yosuke Hanamura in Persona 4, Marth in Fire Emblem, Peter Parker / Spider-Man in Insomniac's Spider-Man. He has a production company Monkey Kingdom Productions with his wife, Tara Platt, where they have produced several feature films and a live-action web series called Shelf Life. He co-authored the book Voice-Over Voice Actor. 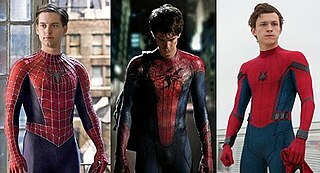 "When you see our Spider-Man suit it’s instantly recognisable as Spider-Man. When you see the red and blue, the iconic eyes, the overall shape and form, there’s no mistaking that as Spider-Man. But… seeing that giant white spider on the red and blue suit, you know that’s different, that’s from a different universe. That’s Insomniac’s Spider-Man." Compression garments are pieces of clothing that fit tightly around the skin. In medical contexts, compression garments provide support for people who have to stand for long periods or have poor circulation. These come in varying degrees of compression, and higher degree compression sleeves, such as sleeves that provide compression of 20–30 mmHg or higher, typically require a doctor's prescription. Compression garments worn on the legs can help prevent deep vein thrombosis and reduce swelling, especially while traveling. Carbon fibers or carbon fibres are fibers about 5–10 micrometres in diameter and composed mostly of carbon atoms. Carbon fibers have several advantages including high stiffness, high tensile strength, low weight, high chemical resistance, high temperature tolerance and low thermal expansion. These properties have made carbon fiber very popular in aerospace, civil engineering, military, and motorsports, along with other competition sports. However, they are relatively expensive when compared with similar fibers, such as glass fibers or plastic fibers. 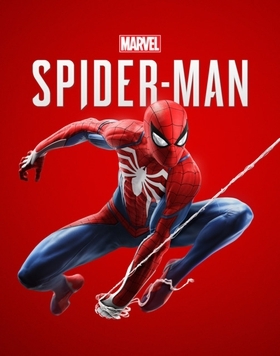 Insomniac's take on the classic Stan Lee/Steve Ditko character evokes everything that’s good about the half-century-old youngster, slinging together a kinetic, high-energy update that’s as much a playground for adrenaline junkies as it is an intimate meditation on the growing pains of a newcomer to adulthood. May Parker, commonly known as Aunt May, is a fictional character appearing in American comic books published by Marvel Comics, commonly in association with the superhero Spider-Man. Created by writer Stan Lee and artist Steve Ditko, the character made her first appearance in Amazing Fantasy No. 15. Spider-Woman is the code name of several fictional characters in comic books published by Marvel Comics. The first and original Spider-Woman, Jessica Drew, had her own animated television series, and the second Spider-Woman, Julia Carpenter, was a regular in the 1990s TV series Iron Man, part of The Marvel Action Hour. There are numerous video games featuring the popular Marvel Comics superhero Spider-Man that have been released. To date, Spider-Man has made appearances on over 15 gaming platforms, which also includes mobile games on mobile phones Operating Systems like Android and iOS. There are several Online web games available on MarvelHQ website. These games can run on any Internet Browser, to learn more about online Spider-Man games, refer to this article as well. Miles Gonzalo Morales is a fictional comic book superhero appearing in publications by the American publisher Marvel Comics, and one of the characters known as Spider-Man. 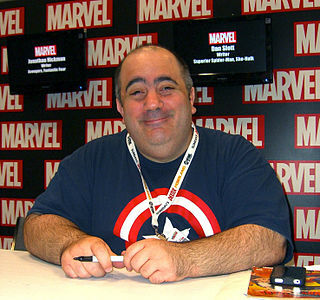 The character was created in 2011 by writer Brian Michael Bendis and artist Sara Pichelli, with input by Marvel's then-editor-in-chief Axel Alonso. The Superior Spider-Man was a superhero comic book series that was published by Marvel Comics that ran between January 2013 and June 2014. The series was written by Dan Slott with artwork by Ryan Stegman, Humberto Ramos, and Giuseppe Camuncoli. It features a reformed Otto Octavius who has taken over Peter Parker's body, and, having allowed Peter to die in Octavius's body but being affected by Peter's memories, is determined to be a better Spider-Man than Peter ever was, and a better man than Otto Octavius. The title replaced the long running series The Amazing Spider-Man, after the conclusion of the "Dying Wish" storyline, as the core Spider-Man book. 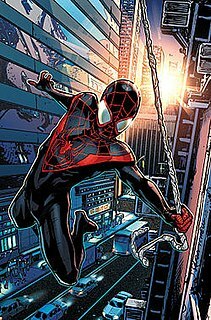 The Superior Spider-Man also crosses over into other Spider-Man titles such as Avenging Spider-Man and its superseding title Superior Spider-Man Team-Up, as well as many other Marvel titles. 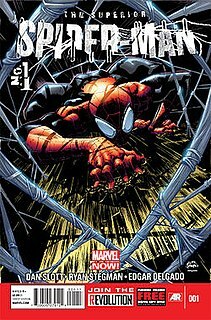 The series ended with issue 31, which determined the fate of Otto Octavius's mind, and was followed by the next volume of The Amazing Spider-Man, in which Peter Parker has regained his body and the Spider-Man mantle. Spider-Man: Into the Spider-Verse is a 2018 American computer-animated superhero film based on the Marvel Comics character Miles Morales / Spider-Man, produced by Columbia Pictures and Sony Pictures Animation in association with Marvel, and distributed by Sony Pictures Releasing. It is the first animated feature film in the Spider-Man franchise, and is set in a shared multiverse called the "Spider-Verse", which has alternate universes. The film was directed by Bob Persichetti, Peter Ramsey, and Rodney Rothman from a screenplay by Phil Lord and Rothman and a story by Lord, and stars the voices of Shameik Moore, Jake Johnson, Hailee Steinfeld, Mahershala Ali, Brian Tyree Henry, Lily Tomlin, Luna Lauren Velez, John Mulaney, Kimiko Glenn, Nicolas Cage, and Liev Schreiber. In Spider-Man: Into the Spider-Verse, Miles Morales becomes one of the many Spider-Men as they team up to save New York City from Kingpin. Spider-Woman is a fictional superhero in comic books published by Marvel Comics. She was created by Jason Latour and Robbi Rodriguez. The character debuted in Edge of Spider-Verse #2 as part of the 2014–15 "Spider-Verse" comic book storyline, leading to the ongoing series Spider-Gwen that began in 2015. "Spider-Geddon" is a 2018 comic book storyline published by Marvel Comics featuring Spider-Man and his supporting cast. In this sequel to Spider-Verse, the Inheritors have found a way out of the decimated world they were imprisoned on and are now determined to take their revenge on the Spider-Army and feed on them once again. Peni Parker is a fictional character from Marvel Comics, a superhero and alternate version of Spider-Man. The character is depicted as a 14-year-old high school student who was adopted by Aunt May and Uncle Ben following the death of her parents. She pilots a psychically-powered mech suit known as the SP//dr, which is partially controlled by a radioactive spider that also shares a psychic link with the pilot. The Inheritors are a fictional supervillain group which appears in American comic books published by Marvel Comics. They typically are enemies of Spider-Man and the iterations of him. 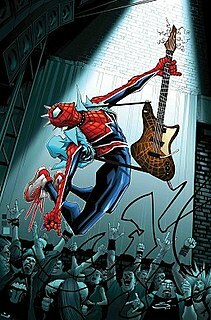 Spider-Punk(Hobart Brown) is a fictional character appearing in American comic books published by Marvel Comics. He is an alternate version of Hobie Brown and Spider-Man. Marvel's Spider-Man: The City that Never Sleeps is an action-adventure game and downloadable content (DLC) developed by Insomniac Games and published by Sony Interactive Entertainment for the 2018 video game Spider-Man. Based on the Marvel Comics superhero Spider-Man, it is inspired by the long-running comic book mythos, and adaptations in other media. Released in three distinct chapters, "The Heist", "Turf Wars", and "Silver Linings". The City that Never Sleeps' main storyline takes place after the events of Spider-Man, and follows the titular character as he confronts a crime wave led by the physically-enhanced mob boss, Hammerhead. He is aided throughout the DLC by the thief Black Cat, Police Captain Yuri Watanabe, mercenary Silver Sable, and reporter Mary Jane Watson. ↑ Carter, Justin (September 7, 2018). "How Spider-Man PS4's tie-in novel shades the game's story". Polygon. Retrieved January 31, 2019. ↑ Spider-Geddon #0. Marvel Comics. 1 2 3 Nero, Dom (September 4, 2018). "'Marvel's Spider-Man' Is Wholesome and Good—And the Best Version of the Superhero We've Seen". Esquire. 1 2 Harmon, Josh. "Marvel's Spider-Man review". EGMNOW. Archived from the original on September 22, 2018. Retrieved September 5, 2018. 1 2 Visser, Josh; Ransome, Noel (October 1, 2018). "The 'Spider-Man' Game Is Better Than Marvel's Best Spidey Movie". Vice. Retrieved April 6, 2019. 1 2 3 Watts, Steve (December 21, 2018). "Marvel's Spider-Man: How Insomniac Spun Its Web". GameSpot . Archived from the original on January 17, 2019. Retrieved January 17, 2019. ↑ Barnett, Brian (September 10, 2018). "How Insomniac'S Spider-Man Came To Be – IGN Unfiltered". IGN . Archived from the original on January 17, 2019. Retrieved January 17, 2019. ↑ Mathew, Adam (November 1, 2017). "How deep is Insomniac's PS4 Spider-sensibility?". Red Bull. Archived from the original on January 16, 2019. Retrieved January 16, 2019. 1 2 3 4 5 6 7 Marnell, Blair (September 10, 2018). "Spider-Man PS4 Writers Explain the Changes to Spidey, MJ's Job, Doc Ock, and More". Syfy. Archived from the original on September 13, 2018. Retrieved October 3, 2018. ↑ "WGA Awards: Full List of Nominations". The Hollywood Reporter . December 6, 2018. Archived from the original on January 25, 2019. Retrieved January 25, 2019. ↑ Ruppert, Liana (April 4, 2018). "Spider-Man PS4 Lead Voice Actor Almost Rejected by Insomniac". comicbook.com. Archived from the original on January 22, 2019. Retrieved January 22, 2019. ↑ Salazar-Moreno, Quibian (September 28, 2018). "Interview: Yuri Lowenthal On Being The Voice Of Spider-Man And His New Show, Orbital Redux". GameCrate.com. Newegg. Archived from the original on January 23, 2019. Retrieved January 23, 2019. ↑ Vader, Leo (April 4, 2018). "Exclusive Interview With The Man Playing Spider-Man". Game Informer . Archived from the original on April 5, 2018. Retrieved April 4, 2018. ↑ Silver, Dan (April 18, 2018). "Spider-Man PS4 | Insomniac Games on crafting its own spin on the web-slinger". The Telegraph. Retrieved April 21, 2019. ↑ Saveedra, John (September 11, 2018). "Spider-Man PS4: New Spidey Costume Explained". DenofGeek!. Dennis Publishing. Archived from the original on January 16, 2019. Retrieved January 16, 2019. ↑ David Liss (2018). Marvel's Spider-Man: Hostile Takeover. Titan Books. ↑ "SYFY". www.syfy.com. Retrieved January 31, 2019. 1 2 Polo, Susana (June 15, 2018). "Video game Spider-Man will enter Marvel Comics canon this fall". Polygon . Archived from the original on January 25, 2019. Retrieved June 19, 2018. ↑ Williams, Mike (September 27, 2018). "Why Spider-Man PS4 Fans Should Pick Up Spider-Geddon #0". USGamer . Archived from the original on October 20, 2018. Retrieved October 20, 2018. ↑ Tim Adams (October 7, 2018). "Spider-Geddon Just Set Up a Sequel to Marvel's Spider-Man Game". CBR. Retrieved October 18, 2018. 1 2 Anthony Couto (June 15, 2018). "PS4's Spider-Man to Make Canonical Debut in Marvel's Spidergeddon #0". CBR. Retrieved October 18, 2018. ↑ Stevens, Colin (December 17, 2018). "Spider-Man PS4 Gets His Own Marvel Comic". IGN . Archived from the original on January 19, 2019. Retrieved January 19, 2019. ↑ Dedmon, Tanner. "Marvel's Spider-Man gets Official Comic Book Spin-off". ComicBook.com. Archived from the original on December 26, 2018. Retrieved December 17, 2018. ↑ Stone, Sam (March 21, 2019). "REVIEW: Spider-Man: City at War #1 (Too) Faithfully Adapts Sony's Hit Video Game". CBR. 1 2 3 4 5 6 7 Tucker, Kevin (September 7, 2018). "Voice actors and cast in Marvel's Spider-Man". Shacknews. Archived from the original on October 2, 2018. Retrieved October 2, 2018. 1 2 Intihar, Bryan (October 30, 2017). "Marvel's Spider-Man: New Trailer Features Aunt May, MJ & More". PlayStation Blog. PlayStation. Archived from the original on January 15, 2019. Retrieved January 15, 2019. 1 2 Dornbush, Jonathon (April 4, 2018). "Marvel's Spider-Man Gameplay, Story Details Revealed". IGN . Archived from the original on April 8, 2018. Retrieved April 7, 2018. ↑ Shanley, Patrick (September 4, 2018). "'Marvel's Spider-Man': Game Review". The Hollywood Reporter . Archived from the original on September 26, 2018. Retrieved September 26, 2018. ↑ Green, Jake (June 15, 2018). "Spider-Man PS4 Release Date, E3 2018 Gameplay, Hands-On Preview Impressions, Sinister Six Villains – Everything We Know". USgamer . Archived from the original on June 18, 2018. Retrieved June 20, 2018. ↑ Brown, Josh (September 7, 2018). "Spider-Man PS4 Voice Actors: Who is the Cast?". Game Revolution. Archived from the original on October 5, 2018. Retrieved October 5, 2018. ↑ Mithaiwala, Mansoor (September 6, 2018). "Marvel's Spider-Man PS4 Ending Explained". Screen Rant . Valnet Inc. Archived from the original on September 7, 2018. Retrieved September 7, 2018. ↑ Radulovic, Petrana (September 7, 2018). "A guide to the Spider-Man PS4 villains". Polygon. Retrieved April 3, 2019. ↑ Spider-Geddon #3. Marvel Comics. ↑ Spider-Geddon #5. Marvel Comics. ↑ Chapman, Tom. "Into the Spider-Verse Trailer Has Spider-Man PS4 Costume Easter Egg". Screen Rant . Archived from the original on October 3, 2018. Retrieved October 3, 2018. ↑ Carter, Chris (January 7, 2019). "Spider-Man has some pretty great names for its difficulty settings". Destructoid . Archived from the original on January 8, 2019. Retrieved January 8, 2019. ↑ "Marvel Spider-Man Advanced Suit Sixth Scale Figure by Hot To". Sideshow Collectibles. Retrieved January 27, 2019. ↑ "GAMESTOP Offers Marvel Legends SPIDER-MAN Game Figures". Newsarama. Retrieved January 31, 2019. ↑ "Marvel's Spider-Man Review -- Insomniac Games' Masterpiece Is Amazing". DualShockers. September 4, 2018. Retrieved January 26, 2019. ↑ Shrewsbury, Reece (October 26, 2018). "Spider-Man PS4: Ranking Every Character From Worst To Best". WhatCulture.com. Retrieved January 29, 2019.